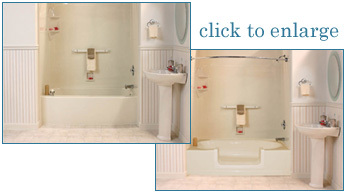 Avoid bathroom accidents with easier shower access. Eliminate the high step over your bathtub in as little as one day! Did you know that bathroom falls are one of the major causes of accidents among people with limited mobility? Getting in and out of a bathtub with high step over is often a dangerous situation for many seniors and can often make living at one’s own home difficult or nearly impossible. According to a recent study by the Council of Aging, more than 250,000 accidents occur each year to Americans aged 60 years or older in and around the bathtub area. Two thirds of adults that fall in the bathtub area will fall again within a six-month period. A Safeway Step conversion eliminates the high step over of your bathtub allowing you to safely enter and exit when showering. This is our most cost effective solution for a tub to shower conversion. Our trained professionals courteously and conveniently handle your installation so you’re free to use your new step-in shower the very next day.